We had a good response to our recent posts, here and here, about the Roman Tenth Legion in Jerusalem. I will post a few photos of other artifacts that are readily available for those who visit Israel. The first is an inscription of the eighth cohort of the Tenth Legion. According to the accompanying sign in the Israel Museum this limestone inscription comes from Jerusalem or Samaria and belongs to the first or second century A.D. The inscription reads “LEG X FRE COH IIX” and is decorated with dolphins and a wild boar, symbols of the legion. Inscription of the eighth cohort of the Tenth Legion. Photo by Ferrell Jenkins. About halfway between Jerusalem and Bethlehem is the site of Ramat Rachel. It was first occupied in the 7th century B.C. Stratum III revealed evidence of a Roman villa dating to the 3rd and 4th centuries A.D. Some of the clay tiles from the villa are displayed in the hotel at the site. Information about Ramat Rachel is available on the Archaeological Project website here. 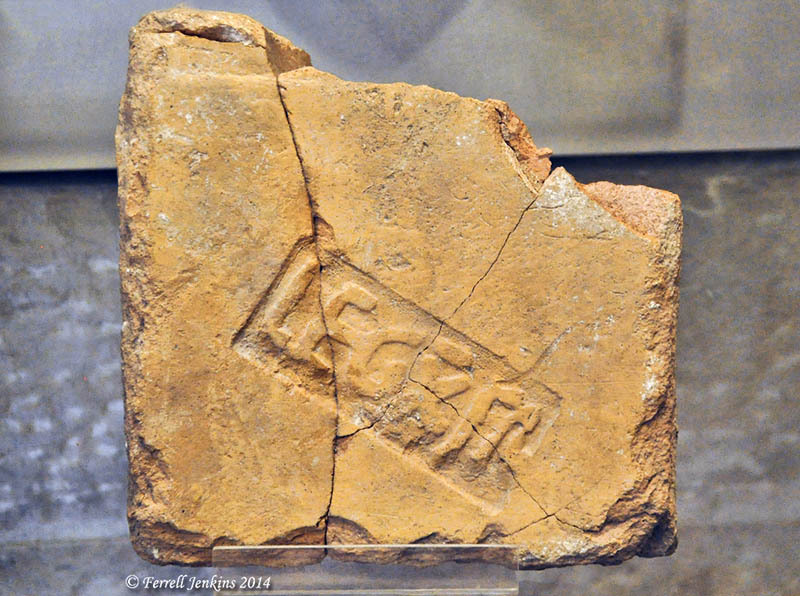 Tile of the Tenth Legion from Ramat Rachel. Photo by Ferrell Jenkins. 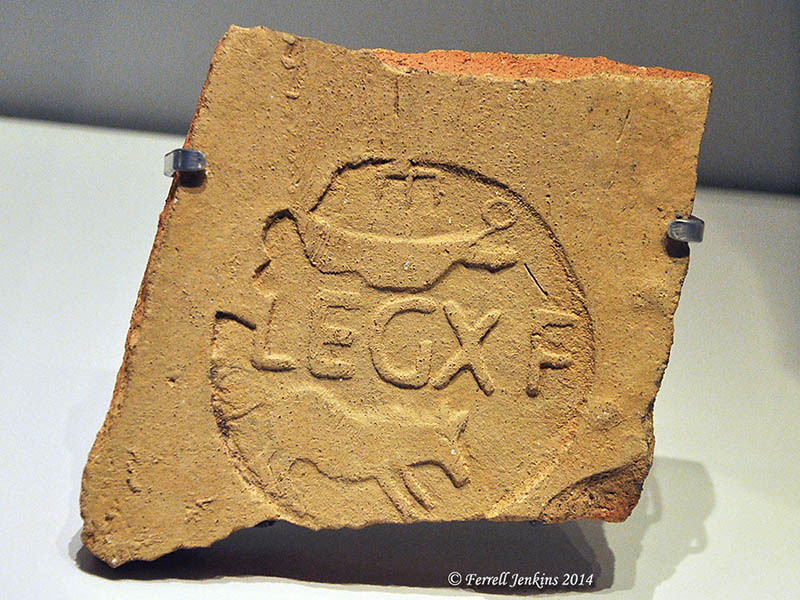 Finally, here is a tile fragment with a stamp of the Tenth Legion. The inscription reads “LG X F.” A wild boar and a battleship are the symbols on this one. The Israel Museum says this tile dates to the 1st-2nd century A.D.
Tenth Legion tile in the Israel Museum. Photo by Ferrell Jenkins. The Roman period in the Holy Land is usually dated from about 63 B.C. to A.D. 323. This includes the entire period of Jesus, the early church, and the New Testament, but it also includes the time of the destruction of Jerusalem and the period when Jerusalem was rebuilt by the Emperor Hadrian and named Aelia Capitolina. Added Note: See the helpful comments by Tom Powers below. Tom is licensed as a guide in Israel, but is no longer living there. Here is the photo he mentions in the comment about the reused stone in the wall of the Old City near Jaffa Gate. 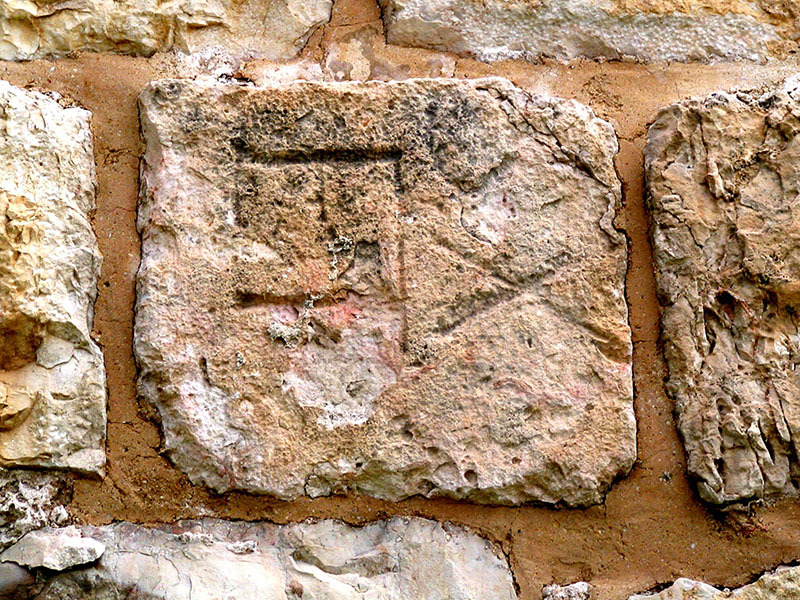 Partial stone bearing inscription of the Tenth Legion reused in the wall of the Old City near Jaffa Gate. Photo by Tom Powers. Students of the Bible are aware that the city of Jerusalem, including the Herodian temple, was destroyed by the Romans in A.D. 70. Vespasian commanded the Romans in the north of the country. When he learned of the death of Nero he began his return to Rome and left his son Titus in command of the military forces. When Titus began to position his forces around the city of Jerusalem, he called the tenth legion from Jericho to come up to the Mount of Olives and take their position there. Jesus had prophesied about forty years earlier that the Holy City would be surrounded by armies. The word used for armies (stratopedon) is used in literature of the time to specify a legion or a camp (see BDAG and MM). Archaeological discoveries have supplemented the writings of Josephus to provide evidence of the presence of the tenth legion in Jerusalem. In addition to the column near Jaffa Gate that we mentioned in the previous post, we here call attention to some other evidence that is readily available for anyone who wishes to see it. Here, I call attention to a Roman milestone. 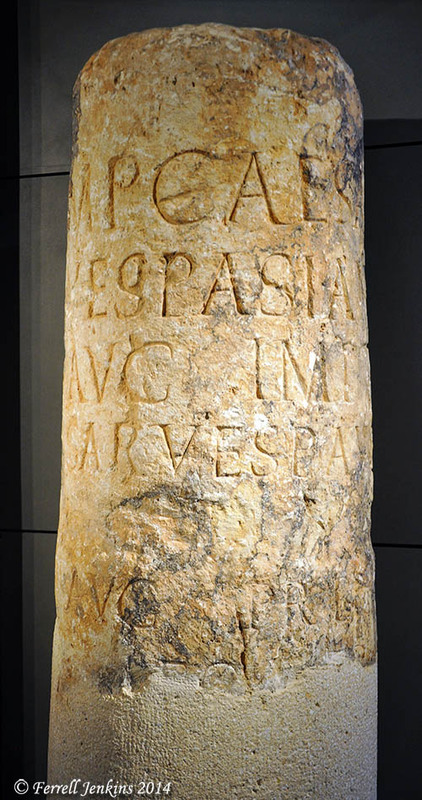 Roman milestone found near the Temple Mount in Jerusalem mentions Vespasian, Titus, and the Tenth Legion. Displayed in Israel Museum. Photo by Ferrell Jenkins. 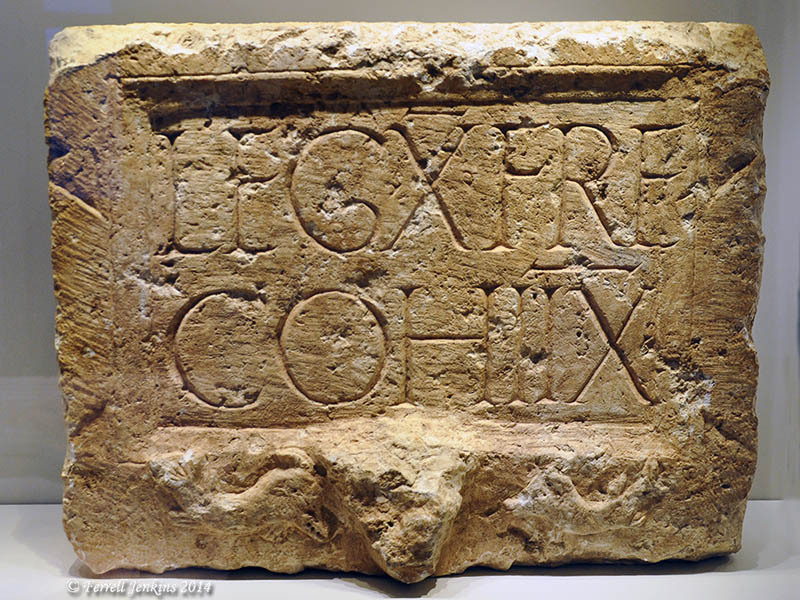 Near the Temple Mount in Jerusalem, a milestone bearing a Latin inscription was discovered. The inscription mentions both the Roman emperor Vespasian and his son Titus, commander of the Roman army at the time of the suppression of the Great Revolt and had been deliberately effaced, seems to have mentioned the name of Flavius Silva, procurator of Judea and commander of the Tenth Legion, responsible for both the destruction of Jerusalem and the conquest of Masada. The inscription was carved by soldiers of the Tenth Legion. I have a few more photos of artifacts mentioning the tenth legion that I hope to post soon.